Like seeing a two headed dog ollieing a skate board or accidently smoking DMT in a traffic jam, stand up paipo surfing is a strange and wonderful thing. 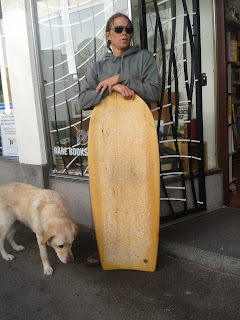 About the least you can have under your feet while still being able to slide across wave faces without being a carpenter from Gallilee, paipo’s take the wave sliding middle man and put him on a vegan raw food diet until he can pigdog the eye of a needle. They’re magic carpets for people who would prefer a magic tea towel. I first fell in love with the idea of riding paipos standing up when I saw the footage of Valentine Chang surfing off the wall on Oahu’s south side on his little red plywood single fin. The surfing is like summer distilled in a moonshiners copper kettle, the board, that little red piece of driftwood from the fountain of youth is pure do it yourself punk. Not long after seeing that I stayed up all night in a blur of Jazz and sawdust and seisemelia smoke and gave birth to the board I named Dr. Strangelove. 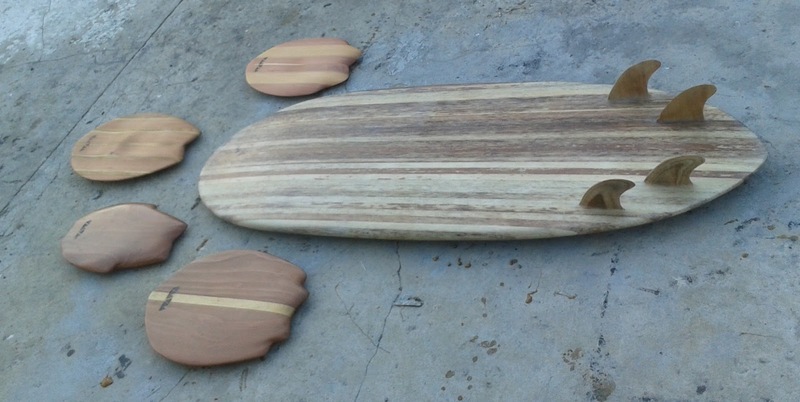 A 3’ something solid wood planning hull, a blend of Greenoughs Velo, the mini Simms and Valentines paipos, a dual keel finned piece of my soul to slide on. Sufing rocky points on the good doctor, mostly without a leash to amp up the adrenaline (without consequences where’s the thrill? ), opened up new worlds, good waves felt like magic tricks. The board was so fast and so small that you had to virtually bodysurf onto the wave but once you got to your feet and set trim it was like you had hitched a ride on a bullet. Last Sunday I was surfing a beautifully formed and apparently rare sandbar up the coast. The waves were small but clean and perfect, like little Kirra bar snacks. I was riding a 3’7” agave and foam composite board, a sort of mini, mini Simmons when one of the local groms asked if him and his mate could have a go. The first grom didn’t do too well, on his 2nd wave the lip went sall Old Testament on him and he came up holding his head and crying. Grom no. 2 though had already learnt the fine art of riding alaias and within a couple goes was looking like a young Derek Hynd, taking off late, keeping low and centred and just flying. I don’t know who was more stoked, me or him. 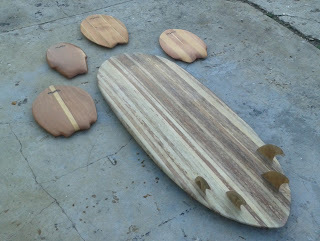 It was early on a Friday evening, the sun was ambling good naturedly down the back of the mountain, sharks were swimming about in their kitchens pondering dinner and I was standing in my wetsuit, in front of my boards, aquatic lovin on my mind, momentarily confounded by choice, like a polygamous president on date night. Now, while it is still true that on the whole, cobblers’ kids go barefoot, I have, nonetheless accumulated a small, rather strange and wonderful quiver. Out of these I usually, at any one time, have a favourite, often a board that I find challenging, that I will ride obsessively in a bull terrierish - I won’t let go until I learn to ride this goddamn thing - manner. 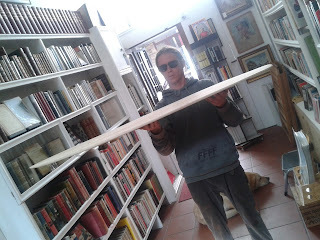 Of late that board has been the 9’6” D-finned longboard that my neighbour John Bramwell of Evenflow Surfboards made. I grew up riding a short board and it’s second nature to me. Logging, on the other hand, is a whole new language and one that, as I now live in Muizenberg, it seems appropriate to learn. 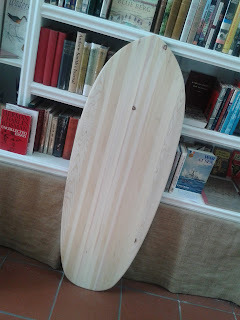 But, I wasn’t feeling it on that afternoon, it was an older love that was calling me, it was my finless, rockerless, leash-less, waxless alaia that I wanted, my reincarnated 1000year old speed demon, my ode to simplicity. Alaias, for me, are at their most fun on clean, small days with running waves and minimal crowds. This was one of those days. Perfect little lefts were laughing all the way to the bank. From my first wave I knew I had chosen the right board. 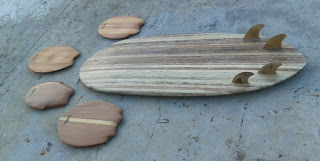 I took off and set trim as the wave bowled along the bank. The board picks up momentum effortlessly and soon you’re going so fast that you feel you ought to do something radical - 360 reverse into the pocket? Josh Redman at Supertubes in Jeffreys Bays doing what he does best on our 'ode to simplicity' made out of agave and recycled foam.